Miami, FL – January 19, 2019 (EmergingGrowth.com NewsWire) — EmergingGrowth.com, a leading independent small cap media portal with an extensive history of providing unparalleled content for the Emerging Growth markets and companies, reports on FingerMotion (OTC Pink: FNGR). Finger Motion (FNGR) has a wholesale license to sell top-up minutes from China Unicom, the second largest carrier in China, to multiple e-commerce platforms. In June, China Unicom reported 299.434 million mobile subscribers which represents the total available market for FNGR. On January 17, 2019 FNGR landed a trajectory changing deal with the 3rd largest ecommerce platform in China. PingDuoDuo (NASDQ: PDD) is a NYSE listed stock with a $27 billion market capitalization. With access to over 385.5 million active users FNGR has a solid chance to prove and scale their business model. Other players that have wholesale licenses are Tencent Holdings Limited (OTC Pink: TCTZF) and Alibaba (NYSE: BABA). These are both e-commerce players so it’s not a surprise the PDD would want to team up with the new kid on the block. Giving access to active users is a major exercise in trust which is why it makes sense that PDD would partner up with FNGR as opposed to BABA. It is also a major credibility boost to FNGR because this $27 billion dollar company is trusting them with their most valuable asset their users. PDD is growing 386% YoY and has increased consumer spending on their platform 99% YoY. This deal with FNGR is a major boost because Top-up minutes represent a sizeable and consistent chunk of the Chinese consumers disposable budget. In addition the Chinese use the mobile phone as a payment platform to pay recurring bills like electric. Investors in PDD should expect additional increases in consumer spending on their platform. With over 385.5 million active users at their disposal FNGR will need to figure out a way to convert these users. What many USA investors take for granted is the ready access to banking. China represents an entirely different cultural shift. Many Chinese people do not have access to traditional banks and there is a huge migration to digital platforms to pay for goods and services. Last year bitcoin and cyptocurrencies took center stage but the hysteria has died down and the mobile phone as a payment platform has taken root. Since all the discretionary things Chinese consumers want to buy and do are online they need a currency to access the things they want. The explosion of sales at PDD represents the burgeoning Chinese consumer demand, but an even greater subset of the people still lack a traditional banking solution. This is where FNGR comes into the picture. FNGR represent a digital banking solution where customers can upload their earning and then spend them. 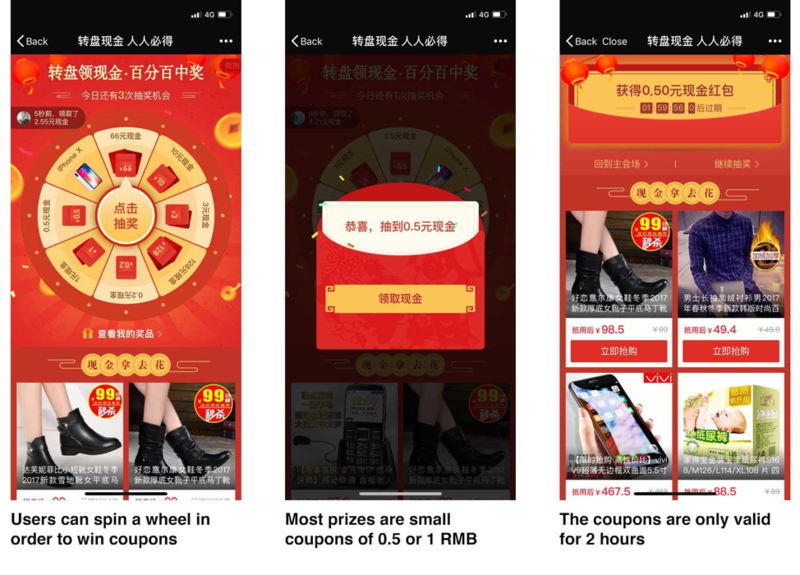 When FNGR launches this new product offering there could very well be a swell of activity as the Top-up solution fills a void for many Chinese consumers at the click of a button. Typical promotional tricks in China give away freebies to entice usage like the playing of a popular game. So very little in the way of marketing could propel adoption of FNGR’s Top-up service. What many investors are probably wondering is why PDD didn’t use Tencent as its Top-up partner. Tencent Holding owns 18.5% of PDD so it follows that they would be the most likely partner. On the last earnings call CEO of PDD Colin Huang said “regarding future collaborations with Tencent we see a lot of areas of concrete projects and new innovation coming out of a closer relationship.” Huang also said “we work very closely with Tencent, using Tencent cloud and advertise on Tencent.” Given this rhetoric, the answer is unclear why FNGR was chosen. It’s reasonable to think some sort of secret sauce or competitive advantage that is proprietary to FNGR is driving this decision. Most speculation would classify the secret sauce as Artificial Intelligence (AI) learning coupled with marketing algorithms. Another key point to highlight is FNGR has no competing e-commerce platform so it can go to other smaller e-commerce players and offer the same solution. FNGR is not viewed as a competitive threat and this is a clear advantage over the other players. The e-commerce market is dynamic so if FNGR’s beta test is positive there could be a very rapid acceleration of sales. The company’s earnings are overdue indicated by their late filing announcement. A future catalyst could be the earnings release. The company did go on record that they were doing about $125,000 daily during the Beta test. Over a 90 day period that could have yielded $11.25 million in sales for this last quarter up from $76,287 in the prior quarter. Any GTV close to this number according to FNGR’s CEO Martin Shen would “reshape our trajectory higher over the coming months.” This could be a game changing number. In the last quarterly update, PDD’s Hung, gave specific guidance on the type of cooperation agreements they were looking for. Hung said “we look at high quality merchants and a variety of factors like service quality and their specific GMV generated. We will continue to incentive them and have a strategy of rewarding them.” Doing a deal with FNGR suggests that PDD believes they are a high quality merchant and they must have generated a good GMV over the past quarter. If investors aggregate this data there is a very good chance of excellent revenue growth during the last quarter for FNGR. Investors should look for a handsome beat. CEO of FNGR Martin Shen seemed very confident that acquisitions were in the works. He commented that they have been “approached by top tier e-commerce platforms and understand our value added business model.” Clearly there is a desire to partner with other e-commerce players. 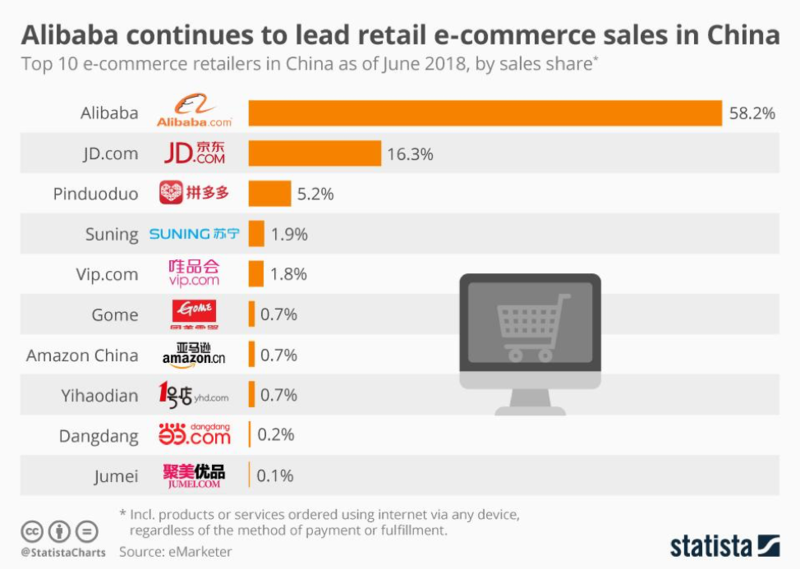 When you look at this chart above it’s really easy to see through the process of elimination that Shen is talking about Alibaba (NASDAQ: BABA) and JD.com (NASDAQ: JD) because they already have PDD. Proving the model with PDD would be an excellent springboard to growth. The company needs capital to expand rapidly to take advantage of the market opportunity. CEO Shen state “we are Keenly aware that only long term financial partners offering non-dilutive financing fit within our business model.” When investors look at the filings there is only $370,000 of convertible notes on the books. The conversion prices are essentially $2.50 and span over the course of 2019. If investors convert and decide to give up their 10% dividend then there would be no more than 255,000 that will come to market between now and May 2019. This is a worst case scenario and if the stock is trending higher there is no reason to convert. The company is also planning an uplisting initially to OTCQB and eventually a senior exchange. These moves seem to indicate the company is positioning for a capital raise. A senior exchange will require cash, shareholders, and significant revenues. At this time there were only 75 shareholders listed on OCT Markets but given the recent activity is seems the shareholder base has been expanding. The company has 19 million shares authorized and has 17,758,753 shares issued and outstanding as of August 31, 2018. There has been a very modest increase in the share count after the business was acquired. The company statement that they are looking for non-dilutive financing seems to be on track with their history of share issuance. The company has only 1.24 million shares left to issue. Using round numbers it’s conceivable that they could do a fixed offering of 1.0 million shares at $5.00 and get some working capital to support business growth and meet listing requirements of a senior exchange. At worst there is a 5.25% potential dilution which is less than the typical spread between the bid and ask. Investment Summary PDD shareholders should consider an investment in FNGR because if FNGR gets traction it could be one of the biggest growth drivers for the company. Eventually growth of PDD is going to slow. 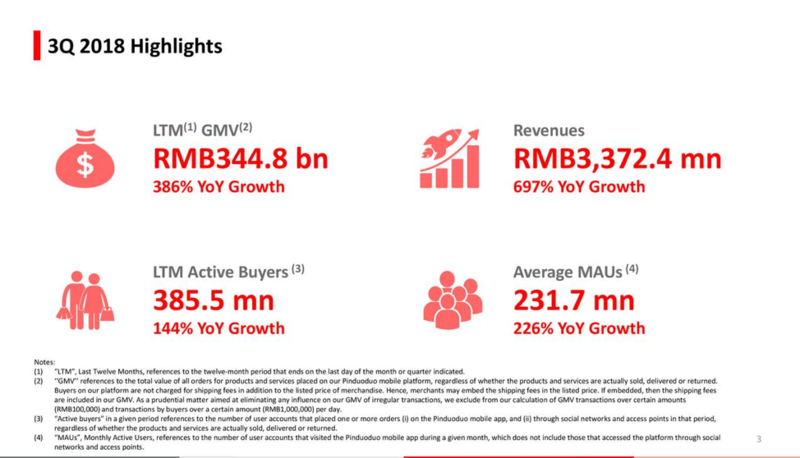 If they have the same user growth of 144% YoY going forward they are going to capture the entire Chinese market in 2 years. This is where PDD has been very diligent to select high quality merchants going forward anticipated the slowdown in growth. FNGR seems to be one of those high quality merchants that has demonstrated to PDD that they can bring in the GTV. In fact they are so high quality that they beat out Tencent a $400 billion + market cap company. Something is brewing and until investors have some visibility via an earnings release all of this is speculation. The stage seems set for a big earnings beat and it appears the company might be looking to raise some money. The company has a very low float that must be under a million shares so the stock could be subject to some volatility. The current market capitalization is $82 million for a company that could do billions in GTV in 2019. PDD trades at 2X GTV. Assuming the same multiple the stock should be trading around $54.00/share. The stock is grossly undervalued and a unicorn in the making given this recent news. The stock has been very quiet over the last year. Volume picked up considerably in the last month and if it continues its trajectory the stock could hit its price target in the next 6 -9 months.